I don’t care what research says! You’ll do what I say… and you’ll like it! In his State of the State address, Andy “Lobbyist for Students” Cuomo chose to completely ignore the growing revolution by students, parents, and educators over his education reform agenda. Rather he doubled down on his efforts instead, proposing a merit pay system that would pay “highly effective teachers” a $20,000 reward. The same merit pay system that has, time and again, failed to work anywhere it has been tried. No mention of the bungled implementation of the Common Core State Standards. No mention of how deeply flawed those standards are. No mention of the obscene amounts of testing being used to torture students. No mention of the disastrous APPR system that he’d want to base these “bonuses” on. Of course Cuomo/Tisch puppet John King thought Cuomo’s idea was wonderful. “We certainly support rewarding highly effective teaching. We know there’s an opportunity to identify teaching practices and allow them to be mentors for their colleagues.” King said. The revolt over Common Core, the Endless Testing regime, inBloom and APPR is not going to go away just because Sheriff Andy ignored it and made as if it doesn’t exist. If anything, Sheriff Andy threw more kindling on the revolution bonfire by doubling down on the agenda with a merit pay proposal based upon test scores. The key now is to have people ask him at every campaign stop he makes in 2014 why he refuses to listen to students, parents and teachers on education issues, why he refuses to acknowledge his APPR evaluation system is an unworkable mess, the CCSS implementation has been nightmarish and every other state dropped out of inBloom so why is NY State still in it? Put him on the spot every day of his campaign for re-election, that’s the goal here. Still, if some students, parents and teachers show up at every Cuomo campaign appearance around the state protesting his education reform agenda (one which he won’t defend publicly anymore – he just continues to implement it), the press will notice, as will his GOP opponent, and eventually he will have to take a public stand on this stuff himself. The point is to make him pay a political price for his refusal to listen to criticism and opposition to his agenda. He wants to run up the score in his 2014 re-election bid in order to set up a 2016 White House run. He got some help yesterday when Chris Christie’s chances of getting elected got stuck on traffic outside the GWB. But students, parents and teachers angry over his education reform agenda can put a crimp in Andy’s re-election campaign this year by putting him on the spot over it. That should be part of the movement against CCSS, APPR, inBloom and testing going forward – continued pressure on the politicians in Albany, especially Governor Cuomo. Over at the B-LoEdScene Blog, Sean Crowley writes that Cuomo Promises Edsels, New Cokes, and 8 Track Players to Highly Effective Teachers. 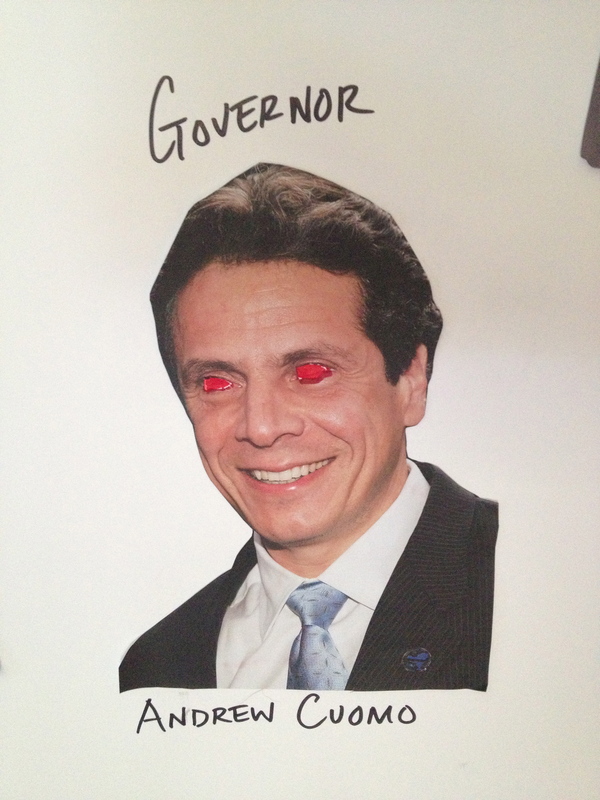 The esteemed Diane Ravitch writes, Cuomo Supports Failed Ideas of Corporate Reformers. This entry was posted in General and tagged b-loedscene, Cuomo, King, Merit Pay, Ravitch, reality-based educator. Bookmark the permalink.